Olivia Cleans Green: Let's Get Kale Krazy with Cooking with CSA! 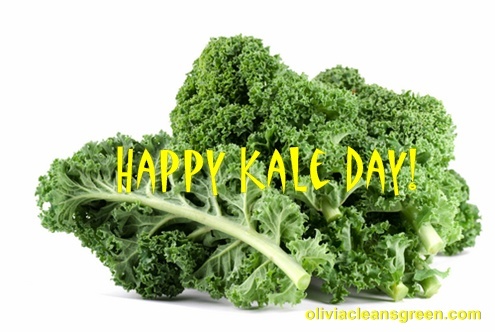 Today is The First Annual International Day of Kale! Yippee! I'm celebrating by joining Sarah and Peter from Cooking with CSA for a Google Hangout. We're going Kale Krazy today (Tuesday, September 3rd) at 6pm EST. I'll show how to clean and store kale. S & P will demonstrate how to make a kicky kale salad. If you have any questions about kale, there will be time for you to ask them too! Register for the *FREE* live Google Hangout here. Who are Sarah & Peter? What's Cooking with CSA? S & P are two ordinary young folks who transformed their lives by switching to a whole foods, plant-based diet and exercising. The enthusiastic couple runs an exciting, and affordable, recipe subscription service designed to get you in the kitchen every night cooking the best seasonal, local foods. All their recipes are vegan and gluten-free, so everyone can enjoy them! I highly recommend signing up for their free 7-Day Healthy Kitchen Series. Happy Kale Day to you too!! Just had some today. What does CSA means? Love what they are doing. Going to add to my blog roll because my greedy self, I mean I'm always looking for new dish to try. :) Thanks for this! Great question Maggi. CSA stands for Community Supported Agriculture. With a CSA members buy shares or portions a percentage of the crops that a farmer will grow for a season. This gives the farmer security that he'll have the money he needs to grow food and provides members with farm fresh food at prices that are generally less than they'll pay at the supermarket or even the farmers market. Glad you're now subscribing to Cooking With CSA! I learned so much from them just from participating in the hangout. I'm kraazy for kale. Awesome hangout and discussion!